The unit was established in May 1986 with one dog and a deputy handler. It has now grown to six full-time German shepherd dog teams. The teams are stationed in Ventura, Fillmore, Ojai, Camarillo, Moorpark, and Thousand Oaks. All of the teams are cross-trained in narcotics detection. All teams are on call 24 hours a day. The K-9 teams participate in a regularly scheduled weekly training program. K-9 patrol teams are routinely used in various high-risk situations as building and open area searches, tracking of suspects, and evidence location. The K-9 unit recently added a seventh K-9 team with a narcotics detection trained black Labrador, assigned specifically to Detention Services. The teams are very popular participants in various public demonstrations. Like no other program within the Sheriff’s Department, the K-9 unit is proudly funded by donations from the communities we serve. 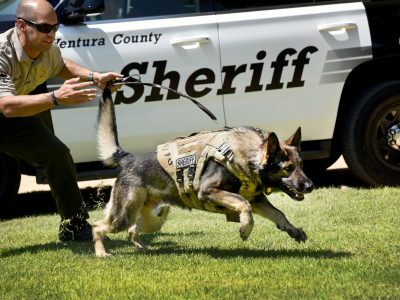 Please visit the Ventura County Sheriff’s K9 Unit website for more information.